Grocery shopped today, so we cleaned out leftovers. Himself killed off the last of the corned beef and cabbage. I finished the bit of cheesy cauliflower soup, made a small tuna salad sandwich, and the last from a tub of Fage yogurt with fresh blueberries. Had to make room for the next tub of Fage. Our online grocery store has been messing up my orders like crazy these past few weeks. Last Sunday I had ordered a small pack of pork side ribs because I can't eat a lot of meat and they were on sale. TB loves them. It was just the right size and was on for around $8 (because of weight it is an estimate until delivery). What I got instead was a 1.7 kg package of sweet & sour style pork ribs worth $26.00! The driver was gone before I noticed it because it wasn't written as a substitution. I did get reimbursed for the difference and TB got a treat tonight. I made traditional sweet & sour ribs with rice and steamed veggies. I had to steam the veggies for me as I can't have the oil for stir frying but TB was fine with that. I had two little ribs to try them, a huge plate of veggies and some rice with the S&S sauce (fat drained out). They were delicious! I wish I could have had more! I made up the whole package and have made freezer containers so TB has meals for when I am either having my surgery or just not up to cooking. So it was actually a very good mistake! Baked ham, potato salad, cream of asparagus-lemon soup, birthday cake for dessert. 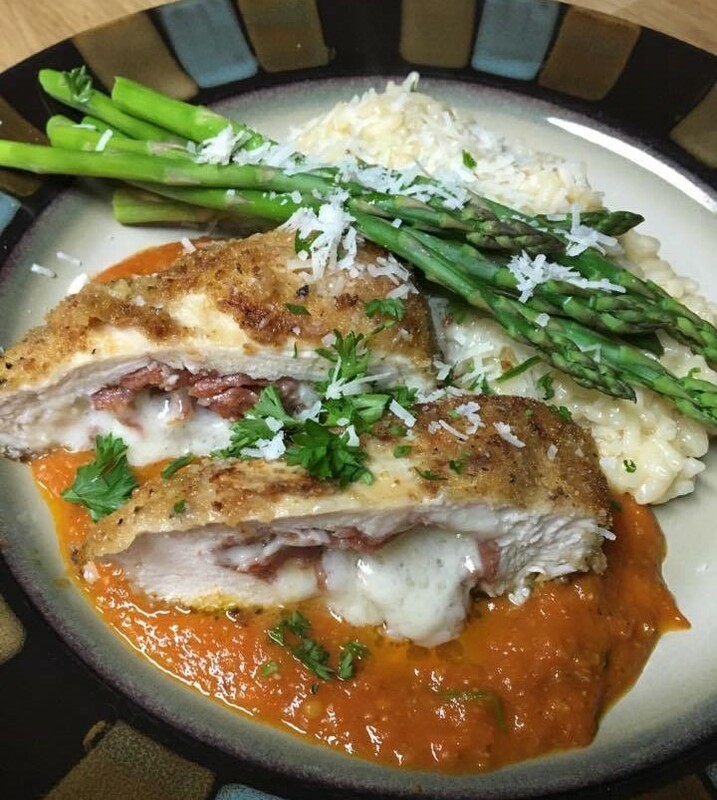 Chicken breast stuffed with Soppressata and Asiago..on a tomato sauce made with my garden tomatoes from last season, risotto Milanese.. .